Shortly after he was elected in November 2016, then President-elect Donald Trump vowed to immediately deport 2 to 3 million undocumented immigrants after his inauguration, saying the focus would be on those with criminal records. Jamal's arrest is the latest example of ICE agents targeting noncitizens with no criminal record. On a recent Wednesday morning, Syed Ahmed Jamal was getting ready to take his daughter to school when he was stopped outside his home in Lawrence, Kansas. Officials from Immigration and Customs Enforcement were on his front lawn. Before Jamal, 55, could say goodbye to his wife and three children, the ICE agents detained him and led him away in handcuffs. 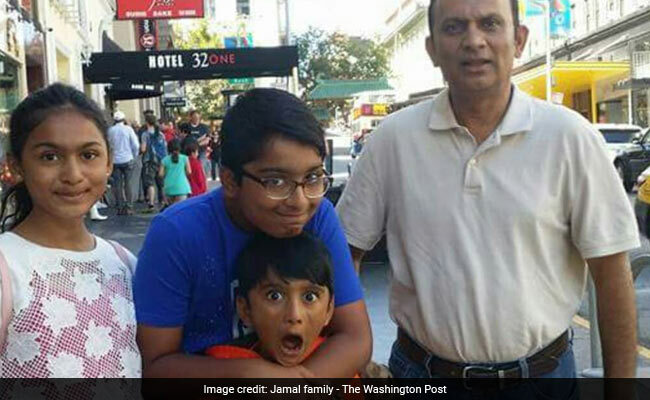 The arrest of a "beloved Lawrence family man, scientist and community leader" came as a shock to Jamal's friends and neighbors in the Kansas City area, where he has lived since arriving in the United States on a student visa from Bangladesh more than 30 years ago. He would go on to also attain graduate degrees in molecular biosciences and pharmaceutical engineering, then settle in Lawrence to raise a family. Along the way, he switched from student visas to an H-1B visa for highly skilled workers, then back to a student visa when he enrolled in a doctoral program, his family said. At the time of his arrest, Jamal was on a temporary work permit, teaching chemistry as an adjunct professor at Park University in Kansas City and conducting research at various local hospitals. In a statement to The Washington Post, an ICE official said the agency "continues to focus its enforcement resources on individuals who pose a threat to national security, public safety and border security." Asked whether Jamal had done anything that would have placed him in this category, the official said that, "as ICE Acting Director Thomas Homan has made clear, ICE does not exempt classes or categories of removable aliens from potential enforcement." Jamal's arrest is also the latest example of ICE agents abruptly targeting noncitizens with no criminal record who have, in the past, been allowed to stay in the country because they were seen as contributing positively to society, according to Jeffrey Y. Bennett, an immigration lawyer who filed a request to stay Jamal's deportation on Friday. During the first year of Trump's presidency, however, many immigrants who were previously allowed to stay found themselves swept up by ICE, such as in the recent case of a Michigan father, too old to qualify for Deferred Action for Childhood Arrivals, or DACA, who was deported to Mexico after three decades in the United States. In January, ICE targeted 7-Eleven stores in a nationwide sweep for unauthorized workers and, later that month, detained a Polish doctor and green-card holder who had lived in the United States for nearly 40 years. "The first wave (of people getting detained) was right after President Trump was elected and came into office. For a few months everyone was basically in hysteria. There were lots of incidents of people getting picked up coming out of the courtroom where they appeared for (check-ins), at churches, jails, schools," Bennett said. "It kind of tapered down over the summer. Now I'm starting to hear over the local attorney listservs, I'm seeing an uptick on the same thing." Jamal's arrest seems to have come during that second wave, he said. In 2011, after Jamal's visa status became invalid, he was given a "voluntary departure" order. The following year, an immigration judge ruled that Jamal was allowed to remain in the country, as long as he checked in with ICE regularly to maintain his work permit. "At that time, President Obama directed the Department of Homeland Security to exercise prosecutorial discretion on certain people who could legally be deported ... and refrain from deporting them if they have more favorable factors than negative factors in their life," Bennett said. Jamal, he believes, easily fits that description, even now: He has three U.S. citizen children - ages 14, 12 and 7 - who depend on him. All five of Jamal's siblings are living in the United States as citizens. His wife, Angela Zaynaub Chowdhury, last year donated a kidney, making Jamal the sole provider. He regularly volunteers in Lawrence Public Schools, where his children are enrolled, and recently ran for an empty school board seat. "Not only does Mr. Jamal teach his children to contribute to society, but he models this belief as well," according to a document Bennett filed with the local ICE office Friday to urge them to grant Jamal a stay of removal. The ICE spokesman said federal immigration judges make final decisions "based on the merits of each individual case." It is on the strength of those merits that Jamal's family, friends and neighbors are hoping to convince immigration officials to allow him to stay. A Change.org petition went up Feb. 2 in support of Jamal, and it has since garnered more than 15,000 signatures urging ICE to grant him a stay of removal. Jamal, they argued, was the very sort of model citizen who should be allowed to remain in the country. Susan Baker-Anderson, who helped start the petition along with Marci Leuschen, said she was shocked when Jamal's wife called her last Tuesday to say her husband could be deported. They are neighbors, and their children participate in the same engineering and "Future Cities" programs at school, she said, and it never occurred to her that was a possibility. "I had no idea. I've never really asked anyone their status, their immigration status. I kind of think that's rude," Baker-Anderson said. "I talked to my friend who's the kids' gifted teacher and another friend . . . and we were like, we've got to do something for the family, and that's how the petition started." Baker-Anderson also organized a letter-writing campaign at her church Saturday in the hopes that notarized testimonials about Jamal from the community would help support a stay of removal. They expected about 50 people, but 500 showed up, she said. "We've just had a huge response," Baker-Anderson said. "It's not like a liberal (vs.) non-liberal thing. This is just a bunch of people in this community that love this family. We have people from both sides of the aisle - people that voted for Trump, people that don't like him - but it's about the family." Since his arrest nearly two weeks ago, Jamal has been held at a jail in Morgan County, Missouri, about a three hours' drive from Lawrence. According to friends and relatives, the family has struggled with uncertainty ever since Jamal's arrest, which two of his children witnessed. The oldest, 14-year-old Taseen, would later tell the Kansas City Star that ICE agents warned his mother she could be charged with interfering if she tried to hug Jamal goodbye on their front lawn. "Hello, my name is Taseen Jamal, and my father has recently been arrested, taken to the Morgan County, Mo., jail, and is being considered for deportation. My little brother cries every night, my sister can't focus in school, and I cannot sleep at night. My mother is in trauma, and because she is a live organ donor, she only has one kidney, so the stress is very dangerous. She could die if he is deported. "If my father is deported, my siblings and I may never get to see him again. He is an older man, and due to the conditions of his home country, he might not be able to survive. My father called us, and he was crying like a little child because he was thinking about what would happen to us if he got deported." "We are the children of Syed Ahmed Jamal, and we are requesting on behalf of our family for your kind help to get back our father," the letter said in conclusion. "A home is not a home without a father." Jamal's brother, Syed Hussain Jamal of Phoenix, told The Post that, as a U.S.-educated liberal secular Muslim who is a member of the Biharis, an Urdu-speaking ethnic minority, his brother could face persecution or death at the hands of radical Islamist extremists if he were to be sent back to Bangladesh. Sayed Ahmed Jamal was the only sibling who didn't have citizenship, even though they all came to the United States from Bangladesh for school, his sibling said. "He was trying everything he could," Syed Hussain Jamal said. "Sometimes it's not as easy as people think to get a green card here. (My brother) had a job, an H1-B visa, then came back on a student visa, you know? And then he was trying to pursue a PhD program and that did not work out ... and that's when he kind of went out of status." Bennett, the attorney, said the family's case now rests in the hands of the Department of Homeland Security, the same department that arrested Jamal. "They are aware that this is a very difficult case to try to get a positive outcome because these stay of removal applications are rarely, rarely ever approved," Bennett said. "But we're giving it a shot, and this is the only thing that we can possibly do at this point to prevent an imminent deportation."